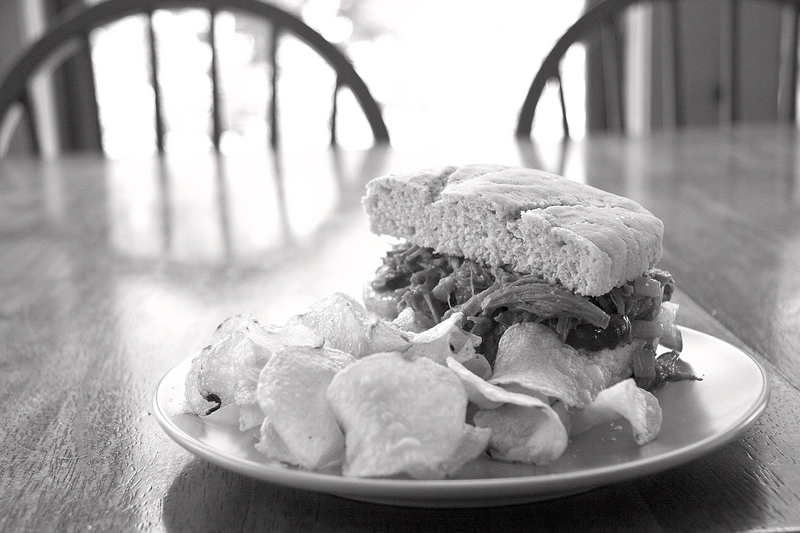 Pulled pork sandwiches. I don't know if there is much more comforting in the way of food. I also haven't had it in years. The problem is, of course, sugar cane. My children and I are allergic, making it very difficult to eat commercially made BBQ sauce. So I decided to improvise. We bought a pork shoulder roast roast at our local farmer's market. There is nothing better than grass fed meat, especially when you know that the animal was treated kindly. 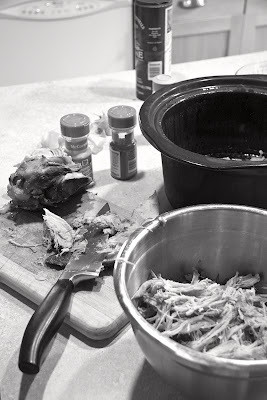 So into the crock pot the pork shoulder went, with unsweetened cranberry juice, maple syrup, and some powdered ginger. While that was cooking, I decided to put my sourdough starter to work. After all, a sandwich must have bread! Usually this recipe makes one standard-sized loaf of bread, or a good sized boule. 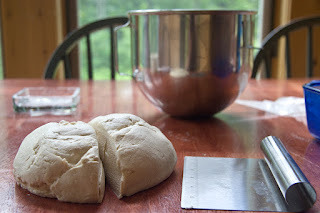 Because I knew I was making sloppy sandwiches, and was likely to make hamburgers later in the week, I decided to make two loaves of flatter bread. The crust, I have found, is far better at keeping juicy contents on the inside of the sandwich - especially in little hands. With that in mind, I buttered two loaf pans instead of the usual one. Next, stir the starter. It naturally separates, and must be recombined lump-free before it is used. Combine the starter, water, and agave syrup in a stand mixer fitted with the paddle attachment. 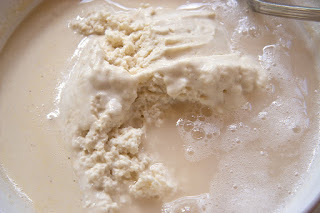 In a separate bowl, whisk together the bread flour mix, sea salt, and xanthan gum. 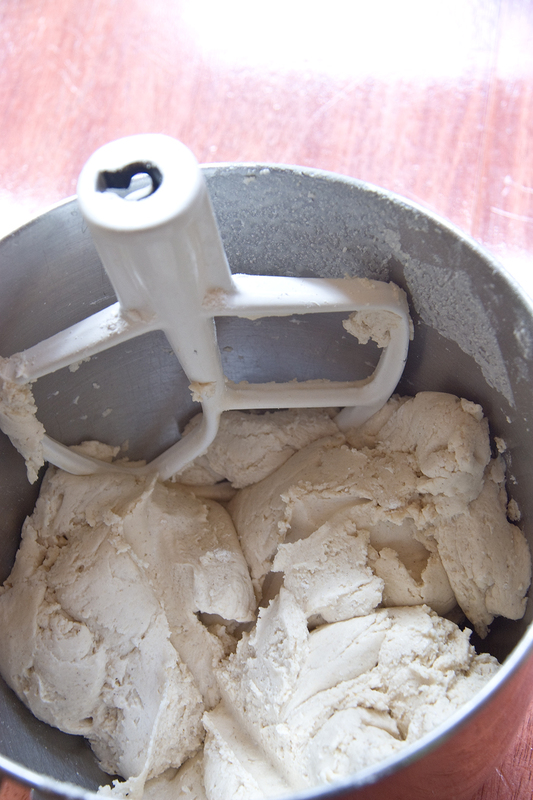 With the mixer set on low, slowly add the dry mixture to the starter mixture, and continue mixing until the dough is free of lumps. The dough should be wet, but hold together. Add more bread flour mix or water until the desired consistency is achieved. Turn the dough out onto a clean surface, understanding that the less flour you use in dusting the better the bread will taste. Kneed lightly, form into a ball, and cut into two equal pieces. put each half into a buttered loaf pan, cover with a clean dish towel, and set in a warm place to rise for an hour, or until doubled in size. About 20 minutes before the end of the rise, preheat the oven to 400 degrees. When dough has risen, place it in the oven and bake for 30 minutes. Then remove from the oven, thoroughly butter (in my case vegan soy free butter) the top, turn, and put back in the oven and bake it until the loaf makes a hollow sound when tapped – about 30 minutes. Turn out of pan onto a cooling rack. The loaf can be cut immediately, but leftovers should cool completely before being stored in a plastic bag in the refrigerator. Cook the pork until it comes apart easily in your hands. Drain the juice. I like to keep it and cook rice in it - yum. Pour in tomato sauce and orange juice, and add spices. Cook on low, being careful not to let the tomatoes scald, until the sauce darkens and thickens. While the sauce is cooking, shred the entire shoulder. Do not discard the fat, but feel free to leave out the tendons. Put the shredded meat and fat back into the crock pot. Once the sauce is done, pour it over the pork and cook on low until everything is heated through, and there is only enough sauce to coat the meat. Cut somewhere between 1/4 and 1/3 of the loaf of sourdough bread off, and slice it in half, horizontally. 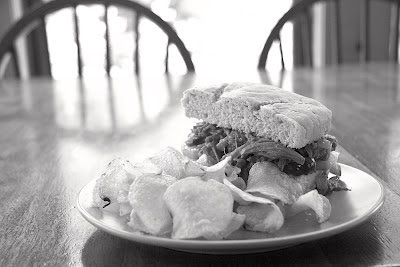 Pile the pork, and whatever else you like on half the bread, and top with the other half. I like bread and butter pickles and goat gouda. Enjoy!